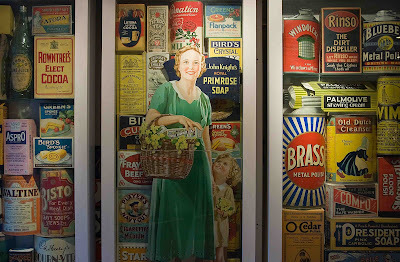 'Oh I remember those' or 'do you remember...' were comments I heard from everyone who was visiting the Museum of Brands, Packaging and Advertising. Stuffed full of toys, games, posters, packing and all sorts of memorabilia from Victorian times to present day. It will be interesting to compare the souvenir program from the Olympic games to be held in London in 2012 to the one for the 1948 games that is on the shelves here. I overheard one woman telling another that she remembered when the man came and lit the street gas lights! I am even more surprised to learn that there are still a few streets in London that remain gas lit. This is a museum I hadn't heard of. How interesting. I will certainly visit this museum the next time I come to London. I'd never heard of it either. Lovely colourful picture, full of nostalgia. Great blog too with pictures and text nicely balanced. Kind regards. Images like this are so nostalgic, Mo. I can see in my mind's eye most of those in your image. Gas lit, eh? I guess it is a link with the past that the Brits are so good at maintaining. Out of interest: where do you hail from if not from London? Wonderful photo -- it seems looking back that past eras of packaging and advertising were more pleasing, graphically, than our own. I wonder if that is because of the greater visual simplicity then, or whether our own will strike people that way in 60-70 years, as well. This is a museum I would really enjoy!